OC Birder Girl: Allen's Hummingbirds and Rufous Hummingbirds: What's the Difference? 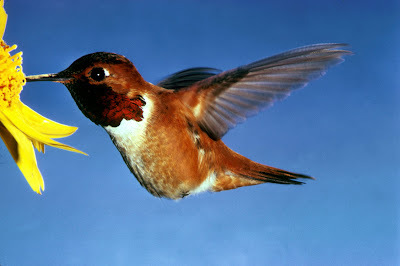 Male Rufous Hummingbird Courtesy of US Fish and Wildlife Service. Photographer Dean E. Biggins, Wildlife Biologist for the U. S. Geological Survey, at the Midcontinent Ecological Science Center in Fort Collins, CO.
"Birder Girl, just found your blog! It is great! I live in Rancho Santa Margarita, so frequent O'Neill, not as much as I used to. Mainly I focus on Hummingbirds. I have around 10 feeders in my back and front yards, plus I try to plant only nectar plants for them. I am really confused on the difference between an Allen's and Rufous. I have some pics of what I thought was both, but now am not sure.I can tell you that I do have a pic of a Costa's I took about 10 days ago. Also pics of a Calliope that I took a few years ago in my back yard. They are such amazing creatures. I would love to hear from you regarding the hummingbirds.Thanks." Male Allen's at my backyard feeder. Notice the green back and rufous tail. The iridescent gorget is not at the right angle to reflect the light in this shot. Thanks for your kind words. Differentiating Allen's Hummingbirds and Rufous Hummingbirds is definitely a challenge. They are very similar. Size: Allen's is slightly bigger--especially our resident Allen's. Color: Color is the same except for the back and rump. Allen's Hummingbird has a green back and rump, but a rufous tail, and the Rufous usually has a rufous back, rump and tail. Even if a rare Rufous Hummingbird has some green on the back, any rufous feathers on the back make it a Rufous according to some experts. Mating Display: Small, but no substantial difference. However, it is a moot point since we would probably not see a Rufous Hummingbird display. This Hummingbird does not breed in Orange County. Audubon Watchlist describes the Allen's display: "The Allen's Hummingbird begins its display with a back-and-forth shuttling, ascends slowly, and then drops in a J-shaped dive." Audubon Watchlist describes the Rufous Hummingbird display: "The Rufous Hummingbird makes a series of steep, J-shaped dives that end at the same point, but begin at points progressing around a circle. The descents are rapid and the upward movements that connect the bottom of the J to the starting points around the circle are slow. During descent, the male emits a stuttering dit-dit-dit-deeer sound, similar but of lower pitch than the Allen's." Range: We have a larger subspecies of Allen's Hummingbird (Selasphorus sasin sedentarius) that is resident here and a smaller subspecies of Allen's (Selasphorus sasin sasin) that migrates. So although we have Allen's all year, there are less during certain times of year. Rufous breeds north of us from northern California north to southern Alaska and winters in Mexico and other parts of Central America. They are also showing up more and more in the Southern United States along the Gulf. In Orange County, California, the Rufous Hummingbird is really only present during migration--usually from approximately March through August. Females: Female Allen's Hummingbirds and female Rufous Hummingbirds are essentially indistinguishable from each other outside in the real world of birding. Immatures: Immatures are essentially indistinguishable from each other. Hybrids: Hybrids do occur. As if things were not confusing enough. 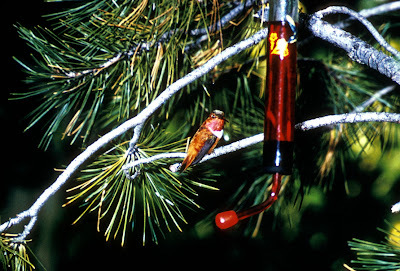 Male Rufous Hummingbird Courtesy of US Fish and Wildlife Service. Photographer Tom Smylie. So, since both the Allen's Hummingbirds and Rufous Hummingbirds appear in Orange County, keep the differences in mind when you are out birding. You might just spot a Rufous Hummingbird--especially during migration. And to my Rancho Santa Margarita reader, thanks for a great question! Very good videos. This is actually the Allen's search on Vimeo, but all of them are Don's. Expert birder and videographer has caught great shots of Allen's Hummingbirds. Good video of a Rufous Hummingbird at a feeder. Note the rufous back in the later part of the video. This video posted on YouTube by psychoticnrg. This is another good video of a Rufous Hummingbird. This one in Louisiana. Posted by seejanebird. Again, notice the rufous back. Video of an Allen's Hummingbird--Note the difference in the color of the back. Check out this video by Don Des Jardin of an Allen's. Notice the green back as it turns around at the end. Allen's Hummingbird from Don DesJardin on Vimeo. Interesting article about a hummer who consistently winters in South Carolina which is out of her range. Good article from the southern Hummer Study Group. Very good article with clearly discussed differences between the two hummers. Thanks for your info! I think I have both! I do have one right now that looks just like the video of the Rufous and it is smaller that the others, that have more green on them, hence Allen's I also have read that there is a difference in their tail feathers, not that you can get close enough to see that!